Located on the banks of the Alapaha River about two miles south of present day Lakeland, GA, the old Union Primitive Baptist Church lies about 10 miles east of where Levi J. Knight settled on Beaver Dam Creek (now Ray City, GA). It was the first church constituted by the pioneer settlers of this region and became the mother church of many Primitive Baptist churches in south Georgia and North Florida. Levi J. Knight’s parents, Sarah and William Anderson Knight , were among the organizing members of the church. The history of Union Church, also known as Burnt Church, was the subject of a series of sketches by Folks Huxford. Like the Knights, the Carters were among the earliest settlers in this section of land which would later become Berrien County, GA, the Knights arriving in 1824 and Carters in 1825. Jesse Carter settled his family on the west side of the Alapaha River about one and one half miles south of present day Lakeland. The Knight and Carter families were soon connected. About 1826, Jessie Carter’s daughter, Rachel Carter, would marry William Cone Knight, son of William Anderson Knight and brother of Levi J. Knight. Upon arrival, Jesse Carter established the first place of worship in the wilderness of the newly opened Lowndes County. 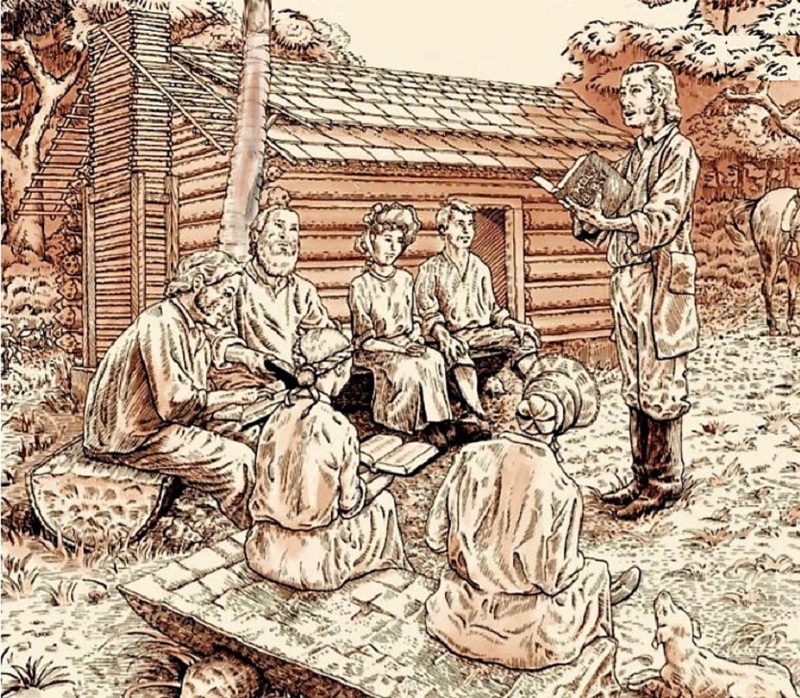 According to Folks Huxford, “The first church building was known as ‘Carter’s Meeting House.’ Of course the name came from the early Carter family that played such a big part in establishing the church. The meeting houses took their names generally from some family that was most active in building the house. Jesse Carter gave the land for the meeting house and built the original building, which was a small log house. The church records do not show that Mr. Carter was ever a member of Union Church but his wife, Mary, was a member.” Jesse Carter would later fight under the command of Levi J. Knight in the Skirmish at William Parker’s Place during the Indian Wars of 1836. In 1825 the primitive baptists convening at Carter’s Meeting House constituted as Union Church. Fleming Bates and Mathew Albritton acted as the presbytery for the constitution of the church. By the goodness of God we whose names are after ritten having been baptized upon a profefsion of our faith in the Lord Jesus Christ having heare before lived in Kettle Creek Church and in Hebron and Macadonice Churches from them, have removed to this wilderness counteary, finding each thereout constituted together. The propriety of becoming a constituted church and we’re on a greede uanamously. Then made application to our several churches for letters with dismission with leave to be come a constituted body at Carter’s Meeting House on the Alappahaw River by which we with the sefrutance of a presbylen intend to be come with the help of God a church independent (as our internal rights) of aney church or churches Presbytory or —— and we do set apart this day for the purpose of becoming constituted for which purpose we do call the following ordained preacher of the Baptist order to act as the Presbytery Lay – Fleming Bates and Mathew Albritton. These are the names of the members on which the church was constituted. The 1st of October 1825 being pronounced a church of Christ in order have united upon equal turmes and heare after be called and known by the name of Union Church.